For a quarter of a century, Florida Lifestyle Homes has been building luxury homes in Southwest Florida. The company has thrived in the area’s growth and bucked the economy’s downturns while leading the industry in design innovation and quality construction. Founded in 1993 by Bill Ennen, Florida Lifestyle Homes is marking this anniversary year with the opening of three new furnished models and the expansion of the company’s “tear down and build new” program. With an in-house architectural designer, a team with expertise in estimating and purchasing, and project managers with years of experience in the industry, the company builds its clients dream homes from concept to completion. Florida Lifestyle Homes is active in Southwest Florida’s newest luxury communities, including Naples Reserve and Quail West in Naples and Babcock Reserve in Charlotte County as well as building custom homes on the buyer’s lot. The company’s primary focus is custom homes typically priced over $500,000. Founder Bill Ennen describes himself as a “muddy shoe builder,” taking a hands-on approach to each home he builds, always on site as construction progresses. Attention to detail and fine craftsmanship are benchmarks of the company’s work. The result is a high rate of customer satisfaction, Ennen notes. As the company has evolved over the years, Ennen has observed some recent changes in the industry. The open floor plan is the sought-after design, with expansive outdoor living areas. Buyers are no longer requiring a formal dining room or formal living room, accounting in part for the reduction in the house size. There are some aspects of home building that remain consistent, Ennen said. Already the recently opened St. Martin II model at Quail West has upheld Florida Lifestyle Homes tradition of award-winning designs, capturing the Superior Home Award presented by the Lee Building Industry Association and adding to a long list of awards the company has earned. 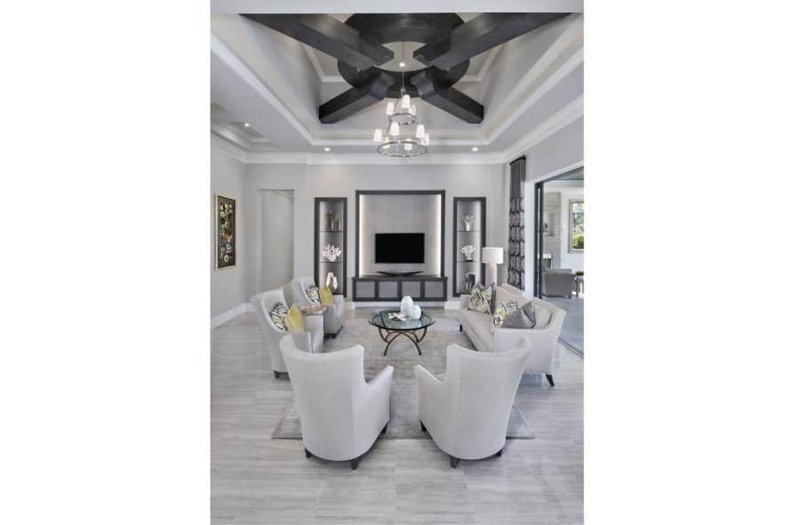 One of the features of the St. Martin II that is characteristic of homes by Florida Lifestyle Homes is the intricate architectural detail of the ceilings, which is evident throughout this fourbedroom design. The company is also known for spectacular outdoor spaces. The St. Martin II excels in that category, with two expansive lanais that include a living area with fireplace, an outdoor kitchen and bar, a custom pool with turf sunning areas, a fire pit and an adjacent putting green. The St. Martin II, priced at $2.895 million including furnishings, recently sold. Florida Lifestyle Homes has also recently opened a new model, the Sydney, at Babcock Ranch, a new eco-centric town being developed off State Road 31, and the Key Largo, a new model at Naples Reserve, a 688-acre master-planned community off U.S 41 East.